What to see in Petrozavodsk? Every tourist ponders what to see in Petrozavodsk. 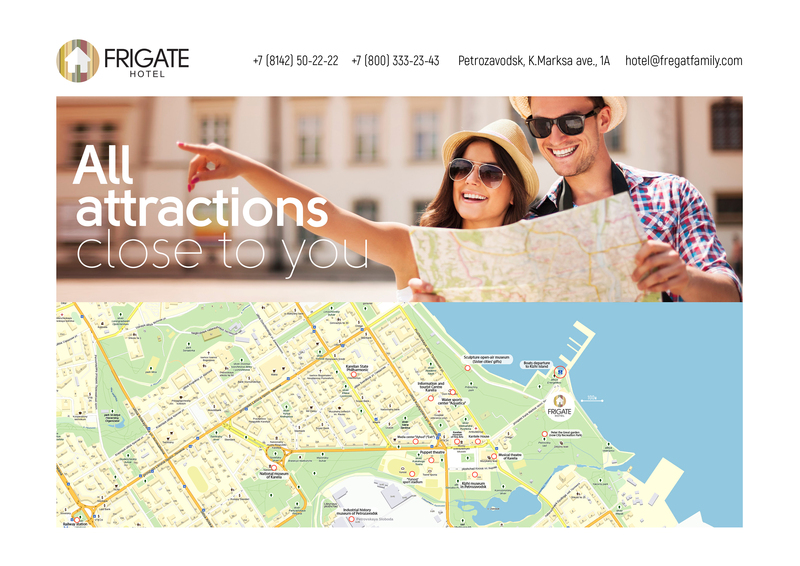 “Frigate” hotel is located in close proximity to the main city attractions, which is convenient for every tourist.In addition to the picturesque shore of Onega Lake, a 10-minute walk away is the beautiful Alexander Nevsky Cathedral, and within walking distance are the Musical and National theaters, Kantele House and the Museum of Fine Arts. Go to Kizhi Island, where the self-titled museum is located - the main pearl of Karelia, a UNESCO World Heritage Site. A stone's throw from the hotel is the pier, from which hydrofoils depart to Kizhi Island, where the world-famous open-air museum is located. The most famous Kizhi legend, known even by those who haven’t been in Kizhi, is connected with the carpenter Nestor, who built the pearl of the island-the wooden Church of Transfiguration without a single nail. Having made 2 steps from the hotel, you can get to the embankment of Onega Lake, which is the main sight of the city. The main attraction of Petrozavodsk, the most beautiful, favorite, almost magical place of rest for residents and visitors of the city. Along the entire length of the embankment, there are monuments, adopted by Petrozavodsk as a gift from sister cities. This is a wonderful place for walks, romantic dates, meetings with friends and delightful photo sessions. A 5-minute walk from the hotel is Kirov Square - one of the central squares of the city. Almost all the buildings located along the perimeter of the square are historical. The current building of the Museum of Fine Arts is the former Olonets Male High School. Nearby is another building, built in 1858 - the former Women's Gymnasium, now the place of rehearsals of the ensemble "Kantele". The central building on the square now is the Musical Theater. Another remarkable building - National Theater of Karelia. Here is also located the Karelian Puppet Theater. Kirov Square is a place where important city events are traditionally held - holidays, concerts, performances, etc. In the historical center of Petrozavodsk, on the former Cathedral Square (now Kirov Square) is an old building of the late 18th century, which had a lucky fate - to carry out the mission of enlightenment. For two centuries there were different institutions: the Main People's School, the Olonets Gubernia Men's Gymnasium, the Palace of Labor, the Public Library, the Palace of Pioneers, the School of Culture. The collection of the museum is a collection of works of Russian art from the ancient icon painting of the XV centuries to the works of contemporary artists, as well as a number of works of foreign art. Today, the collection of the museum has about 16,000 items of storage. A walk from the “Frigate” hotel to the National Museum of Karelia will not take more than 10-15 minutes. The National Museum was founded in 1871 and is one of the oldest museums in the North-West of Russia.The museum collection (over 225 thousand items) represents nature, archeology, history of the region and Petrozavodsk, the traditional culture of Russians, Karelians, Vepsians. National Museum exhibits permanent and temporary exhibitions. Much attention is paid to the unique nature of Karelia, the animal world and archaeological finds, especially petroglyphs - ancient rock carvings. The Governor's Park is a place of rest for citizens, located in the neighborhood of the National Museum of Karelia. The Governor's Park is a recreation place for citizens, located in the neighborhood of the National Museum of Karelia. It differs from other parks in Petrozavodsk by a large collection of sights. Any self-respecting tourist should see all the historical monuments from the plant of Peter's times (cannons, cores, part of the railway) and simply here you can always relax sitting on beautiful benches. The park was reconstructed to celebrate the 300th anniversary of the city. At the same time, in 2003, a monument to Gabriel Derzhavin, a famous poet and former governor of the Olonets province was erected. Hence the name of the park.